By FFWPU Singapore, September 20, 2015: The FFWPU community in Singapore held our second Blessing Festival on the 20 September 2015. Singapore is a nation of diverse ethnic groups with multi-religious denominations living peacefully in harmony, and hence, it is an ideal place for a joint cultural and interfaith peace marriage celebration. The event, called the Multicultural Family Peace Blessing Festival, gathered 47 previously married couples in a banquet styled wedding ballroom, with more than 100 guests in attendance. The couples came together to re-dedicate their marriage vows, in the hope of revitalizing the quality of their marriages, and understanding the significance of the ancestors’ lineage and the building a 3 generation family. Some foreign couples from Myanmar, Japan, Philippines, India, etc, who are currently working in Singapore, also participated in the Blessing Festival, and their attendance added a colourful and joyous delight of mixed nationalities and traditions to the entire Festival. 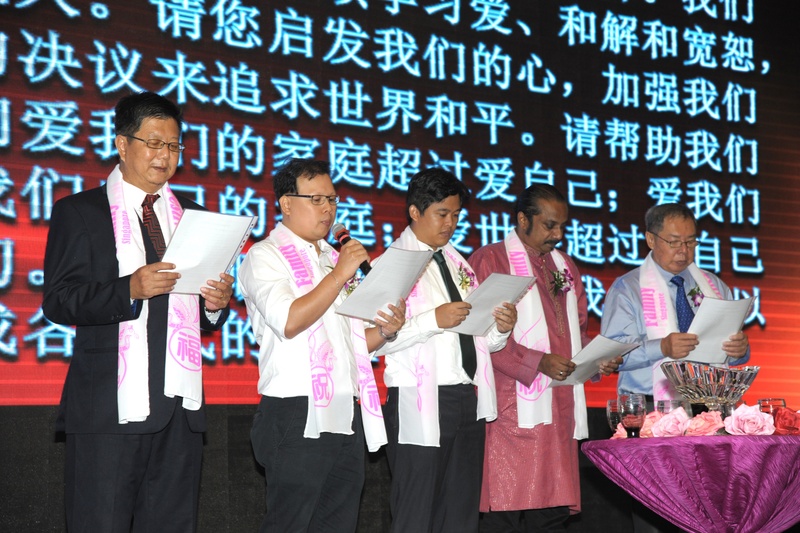 The FFWPU Singapore community hopes that through this Blessing Festival, they could work to promote the importance of strong family ideologies and the universal values of giving birth to our future descendants and raising them as children of good moral characters, so that they could contribute to the continuous building of a harmonious society and a prosperous nation. This is the second of the many more fruitful Blessings to come and we hope the government of Singapore could celebrate such wonderful event in a joint effort to bring about a lasting peace based upon the building of ideal families.